Malcolm X (May 19, 1925 – February 21, 1965) was an African American nationalist and civil rights activist. Before he became Malcolm X, his original name was Malcolm Stuart Little. Malcolm X's father was a Baptist minister whose skin was very dark, whilst his mother's skin was of a much lighter tone. His parents taught him to be proud of being black in an openly anti-black society. In 1946, Little was put in prison for burglary and discovered the Nation of Islam while he was there. At first, Malcolm X's actions and speeches were mostly inspired by the beliefs and teachings of the Nation of Islam. He taught that all white people were bad. Once he learned that the leader of the Nation of Islam was in relationships with many women, he quit the group and changed his religion to Sunni Islam. He went on a pilgrimage to see the Islamic holy city of Mecca in Saudi Arabia. At this point, his opinions of white people got better, and he began to believe that white people could be good people, too. 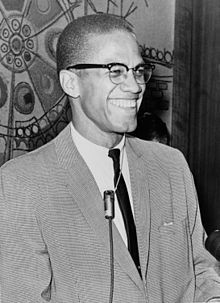 Malcolm X believed that black people should fight for their civil rights in any way they could, even if they had to become violent. He also thought that black people should support one another by shopping in stores owned by black people. He was critical of the civil rights movement. Malcolm X had six children with Betty Shabazz. He had six grandchildren. Malcolm Shabazz was killed in May 2013. He also has two great grandchildren. Malcolm X was shot dead in New York City after preaching about black rights. Three members of the Nation of Islam had a part in his murder. ↑ "Malcolm X". American Radio Works. Public radio.org. Retrieved September 24, 2013. This page was last changed on 11 March 2019, at 15:05.